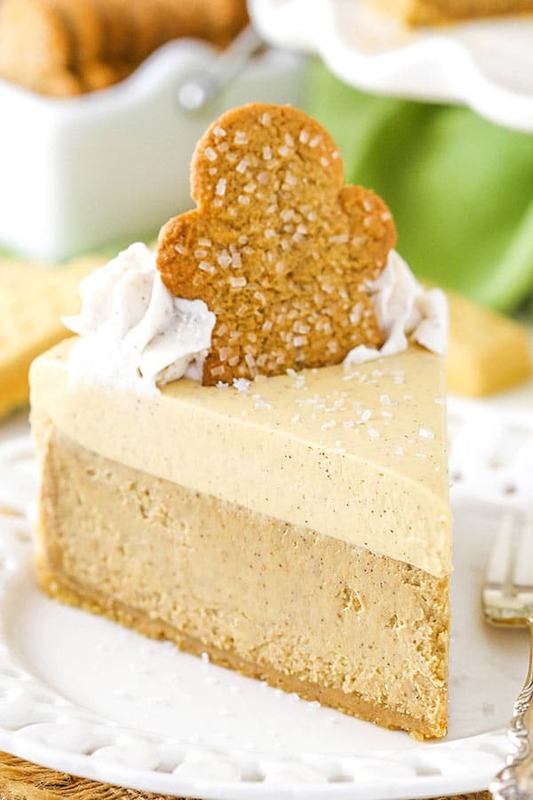 Gingerbread Cheesecake Recipe with Molasses Mousse Topping! 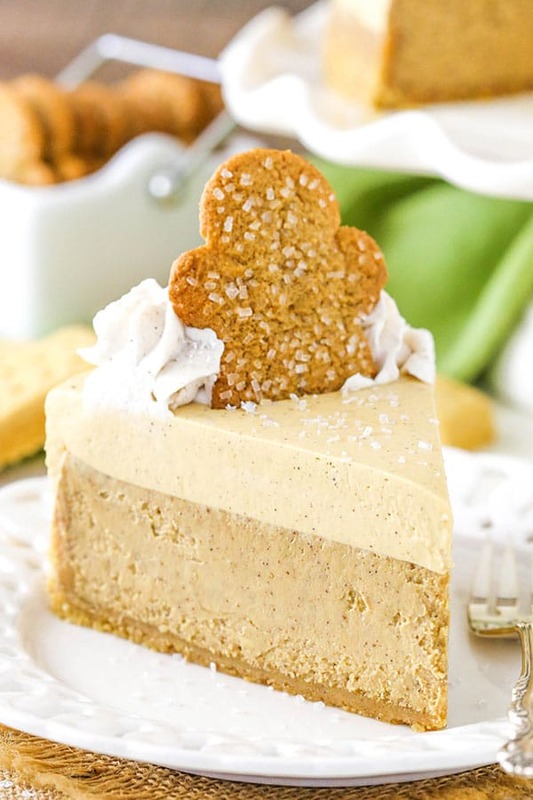 This Gingerbread Cheesecake recipe is made with a delicious shortbread crust, gingerbread cheesecake filling and a molasses mousse topping! Perfect for the holidays! November is in full swing and I feel like the end of the year is moving quickly! 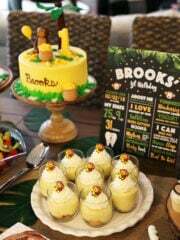 We had a baby shower this past weekend in Charlotte with family and friends and it was wonderful. It was not only beautifully done, it was also very special. We celebrated with a group of people that I’ve known most of my life and are very familiar with our journey to getting pregnant and it was so wonderful to feel everyone’s excitement and be able to celebrate with them. But now things really feel like they are moving! We’ve been busy getting ready to move into our new house, our current house is under contract and the holidays are fast approaching. Before we know it, Thanksgiving and Christmas will be upon us. 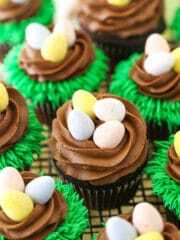 It’s such a fun time of year and a great time for baking – I can’t wait! Gingerbread is one of my favorite flavors of the season. All the spices are just what this time of year is about. 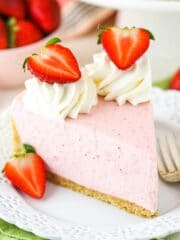 And this cheesecake has three great components that make it especially delicious – the shortbread crust, the thick and creamy cheesecake filling and the smooth mousse topping. So fun! To get started with the crust, you’ll want to get your hands on a couple boxes of Walkers Shortbread. I used the shortbread fingers, but feel free to use one of the other varieties. If you’ve never tried their shortbread before, you really should. It’s the best! So buttery and delicious – it’s hard to stop eating. And it makes a delicious crust. Pop the shortbread into a food processor to grind it into crumbs. It’s combined with a little sugar, cinnamon and butter and then pressed into a springform pan and pre-baked. 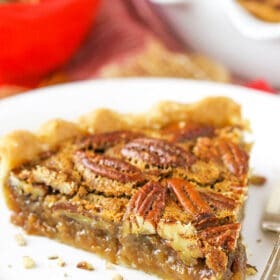 The filling is flavored with brown sugar, molasses and lots of tasty spices! Of course ginger is the star of the show here, but there’s also a good bit of cinnamon and nutmeg, as well as some cloves. All the spices are what makes gingerbread so darn tasty! 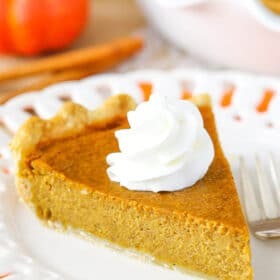 Be sure not to mix the filling at too high of a speed, as it can add extra air to the filling and can cause cracks during the baking and cooling process. Once the cheesecake is baked and cooled, you’ll want to add the mousse. It’s a molasses mousse with some cinnamon and nutmeg. You’ll add the mousse topping to the cheesecake while it’s still in the springform pan, then allow it firm up a bit before removing the sides. The cheesecake is then finished off with some swirls of whipped cream and a few gingerbread men. The final cheesecake is fun, festive and delicious! It was a big hit with all my taste testers and is perfect for the holidays – whether for a party or for your dinner table. I can’t wait for you to try it! 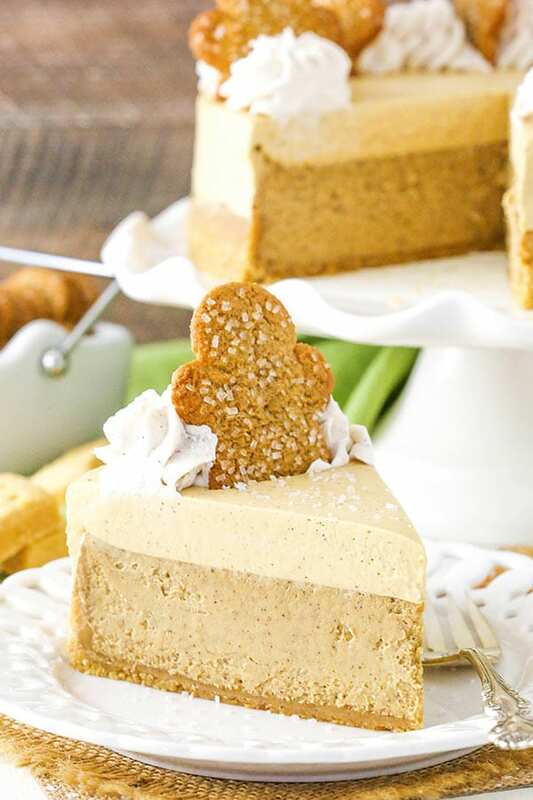 This Gingerbread Cheesecake recipe is made with shortbread crust, gingerbread cheesecake filling and a molasses mousse topping! Perfect for the holidays! 1. Preheat oven to 325°F (163°C). Line a 9-inch (23cm) springform pan with parchment paper in the bottom and grease the sides. 2. Combine the crust ingredients in a small bowl. Press the mixture into the bottom and up the sides of the springform pan. 4. Cover the outsides of the pan with aluminum foil so that water from the water bath cannot get in. Set prepared pan aside. 5. Reduce oven to 300°F (148°C). 6. In a large mixer bowl, mix the cream cheese, sugar and flour until well combined (Use low speed to keep less air from getting into the batter, which can cause cracks). Scrape down the sides of the bowl. 7. Add the sour cream, molasses, vanilla extract and spices and mix on low speed until well combined. 8. Add the eggs one at a time, beating slowly and scraping the sides of the bowl after each addition. 9. Pour the cheesecake filling into crust and spread evenly. 10. Place springform pan (covered with aluminum foil) inside another larger pan. Fill the larger pan with enough warm water to go about halfway up the sides of the springform pan. The water should not go above the top edge of the aluminum foil on the springform pan. 11. Bake for 1 hour and 20 minutes. 12. Turn off heat and leave cheesecake in oven with door closed for 30 minutes. 13. Crack oven door and leave the cheesecake in the oven for about 30 minutes. 14. Remove cheesecake from oven and chill until firm, 5-6 hours or overnight. 15. When cheesecake has chilled and is firm, make the mousse topping. Add heavy whipping cream, powdered sugar, molasses and spices to a large mixer bowl and whip until stiff peaks form. 16. Set the whipped cream aside and in another bowl, beat cream cheese until smooth. 17. 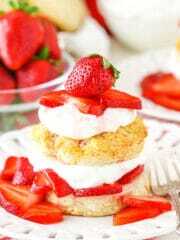 Fold whipped cream into cream cheese until well combined. 18. With the cheesecake still in the springform pan, pour the mousse on top and spread into an even layer. 19. Set in the fridge for another 1-2 hours, until mousse is firm, then remove from the springform pan. 20. Add the ingredients for the whipped cream to a large mixer bowl and whip until stiff peaks form. 21. 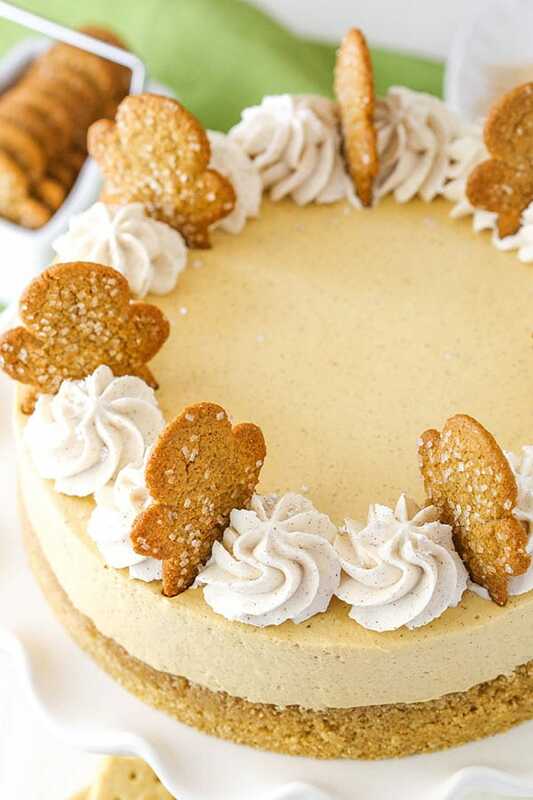 Pipe whipped cream around the edges of the cheesecake and decorate with gingerbread men. This is a cheesecake calling my name. Looks yum-o! If the eggs were omitted could this be made as an uncooked cheesecake to set in the fridge ? Not quite. You’d also want to remove the sour cream and depending on how soft it was with the molasses, you might also want a little gelatin to firm it up. I so look forward to making this! It is beautiful and ginger is simply one of the greatest flavors. 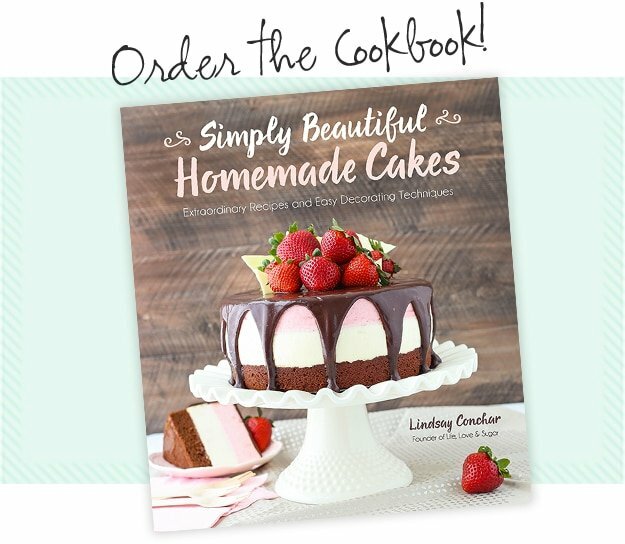 Thank you for your fantastic recipes, Lindsay! 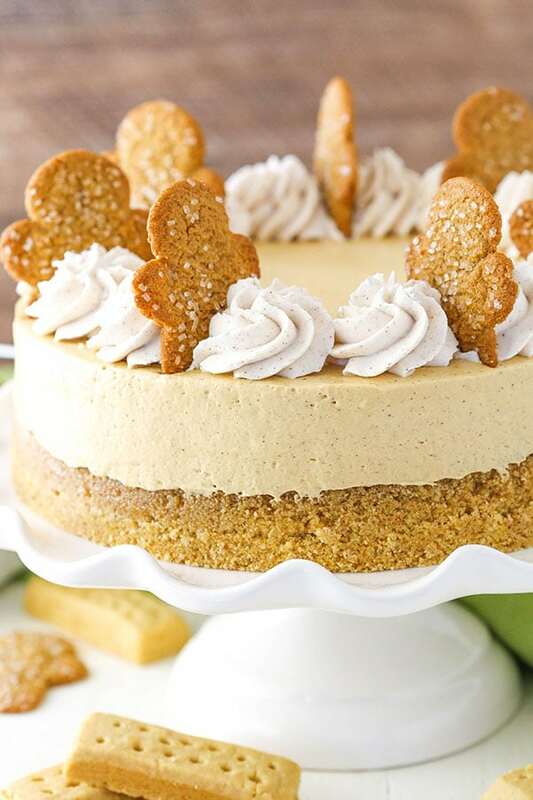 A gingerbread cheesecake sounds so fun and festive. I had never heard of that brand of shortbread and I will need to try it! I hope you enjoy it! Definitely my favorite shortbread! Hi Lindsay – can I just ask a question? I’m trying to master the art of frosting a cake as well as you do (I’m still a long way off!). In your videos (which are really helpful by the way), you often use a fondant smoother and paper towel – can you use these tools to smooth a cake with butter icing? I always thought they were just for fondant icing, so haven’t invested in a fondant smoother (I’ve never used fondant icing as I don’t like the texture). I just can’t seem to get the same standard of finish as you do, and thought perhaps these tools would help me? fills the air as the desserts bake. Looking forward to making this cheesecake! I love the little gingerbread men with the sanding sugar on them. Were those purchased or could you direct me to the recipe for those? Thanx much!!! I just get them at the grocery story on the cookie aisle, right by the Walkers Shortbread actually. :)???? They are Pepperidge Farms. Hi! I really really love reading your stories and trying your recipes, and hope all is well by you. Yes, they’d be great as mini versions. 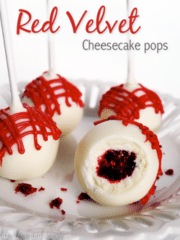 I have several mini cheesecakes around the blog. Feel free to check those out to get an idea of instructions and such, if needed. Usually bake time is roughly 18 minutes with some cooling time. 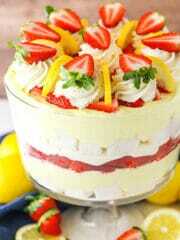 Looks soooo yummy! Where do you get those cute thin little gingerbread men? Are those Walkers brand as well? I must make this!! I guess ginger thins would be ok ! Thank you! I just get them at the grocery story on the cookie aisle, right by the Walkers Shortbread actually. 🙂 They are Pepperidge Farms. I am not a big fan of cheesecake but my family is and this recipe has really peaked my interest… it looks deliciously fabulous! 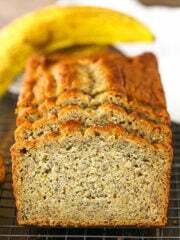 I LOVE ginger so I am excited to try this recipe. Thank you! 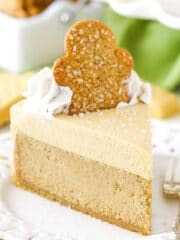 I discovered your site today and am already in lurvv with the gingerbread cheesecake recipe! For the cheesecakes on my site, water baths are necessary in my opinion. 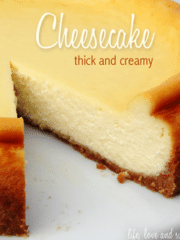 There are some cheesecakes that can bake fine without one, but often not using one lends a drier cheesecake that falls in the middle and cracks. I hope that helps! This is a beautiful work of art! I have made several of your cheesecakes and they are delicious. Forgive me if this question has been answered somewhere…how do you get your cheesecake OFF the springform pan bottom? The two times I tried…I broke it! Do you have a giant spatula or special tool? The times I have gifted cheesecakes, the bottom of my springform pan has been returned with scratches 🙁 I greatly appreciate your advice! Thank you & God bless! I’m so glad you’ve enjoyed the cheesecakes! I can usually remove the parchment paper if I want to try, but it can be a little tricky to not hurt the cheesecake in the process. I usually use an offset spatula (9 inch) to wiggle between the cheesecake bottom and parchment and then remove the spatula and insert a cake lifter (affiliate link) that will allow the cheesecake to rest on it so it doesn’t break. Push that lifter between them as you remove the parchment and it should come off fine and the cheesecake shouldn’t be damaged. I hope that helps! It does indeed help, Lindsay! Thank you so much for your reply! Now I know what I want for Christmas! God bless you and the babies! Can you freeze the cheesecake before the mousse topping and finish it later? Thinking I need to make this with the gluten free walkers shortbread! Definitely! Their gluten free shortbread is great! Can this be made a head of time and put in the freezer? I love to bake and have a few people who want one. Id like to do them in advance, like a week.. I don’t tend to freeze things much, but I think the cheesecake would be fine. I might suggest adding the mousse topping only after it’s been defrosted though, just to be safe. Thanks for the recipe! I’m planning on making it for a fundraiser. Do you have any tips on how to remove the cake from the pan onto the cake plate without getting the parchment paper too? Thanks! Hi, I’m in Scotland (just down the road from the walkers factory actually!!). When you say molasses, is that what we would call black treacle? How fun that you’re so close to the factory! I hadn’t heard of black treacle, but did some googling. They do appear to be quite similar. It should work fine as a substitute in the cheesecake. I hope you enjoy it! Hi! I’m currently baking this at 300F like the recipe and it’s been in there for an hour and 20 minutes and hasn’t baked at all! Is something wrong? It would seem like something isn’t right if it truly hasn’t baked at all. However cheesecakes will still look jiggly in the center and be set around the edges when they are baked to that point in the process. When you turn off the oven and let it sit for another 30 minutes, it’ll continue baking and continue to firm as it cools. So it might just seem like it’s not baked, but it might be right on track. Hi! Made the cheesecake part already! Looks great! I’m excited…the part I️ keep failing at is the mousse 🙁 Ive already screwed it up twice! Any tips? Thank you! Can you describe the problem you’re having? Then maybe I can help? Hi I just made this cheesecake, it tastes delicious but the mousse is tricky. I was wondering what the other commenter that mentioned problems with the mousse had issues with. Mine was very lumpy when you fold the whip cream mixture into the cream cheese. I had to beat it with my mixer and it still has little lumps throughout. It’s fine but not what I’d really like. The cream cheese was quite soft so I think next time I would mix the molasses and spices with the cream cheese and fold whip cream into that. It hopefully would make it easier to fold together. Otherwise a nice recipe. My guess would be that the lumpiness is from the cream cheese being a little bit cool still. You are right though that you could change up the order of mixing things to thin out the cream cheese and achieve the same result, perhaps without lumps. I can’t find the shortbread crumbs at my super market, do you think I could just make my own using shortbread cookies? Yes, that’s what I do. I put the shortbread in a food processor to get the crumbs. Hi Lindsay! I want to make this to send home with some dinner guests we’re having this weekend for their Christmas dinner. Will it freeze well without the whipped cream? I would think it should freeze fine. Has is already cooled completely in the fridge? Once completely cooled, it should be nice and firm, not soft. Woot! I pulled up cheese cake on Pintrest for my hubby to pick a new one. Oh Batman! So yum! Bad news, Walkers is not available where I am at. Ridiculous right?!? Made due with homemade Walkers copycat recipe. I had no cracks and my kids loved licking the mousse bowl clean. Amazing holiday cheesecake. Served it with French vanilla coffee. It was loved by everyone who ate it. Including my 2 year old. Thank you! I’m so glad you enjoyed it! Thanks Kat! Hi I’m just wondering about the gingerbread men decoration is there a recipe to make them or are they store bought? I would like to make this recipe but half of it and i wonder if you know the size for my cake pan that would fit and the how long it should be in the oven ? Thanks. I’ve not made a smaller version before, so I’m not real sure of the baking time. What is the best way to soften the cream cheese? Thanks. I leave it on the counter for several hours, until soft. I like to take my cheesecakes out of the refrigerator for about an hour before serving. Would that amount of time cause the mousse layer to become too soft? 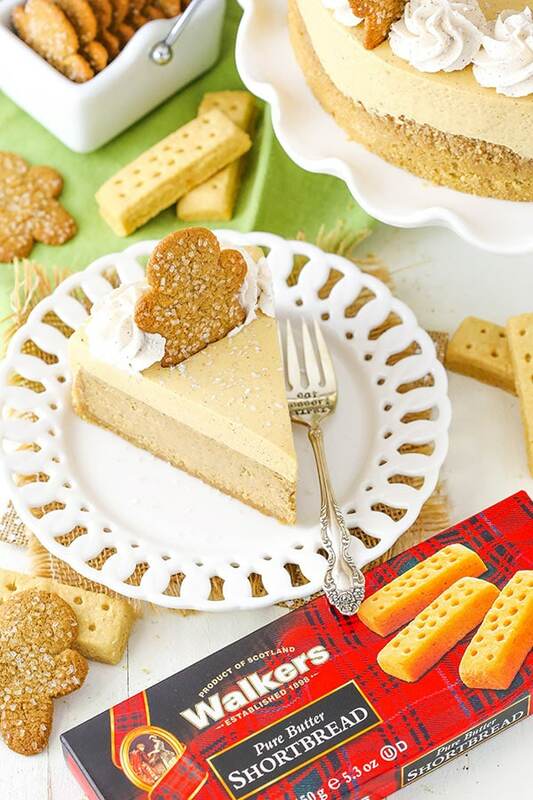 Could you swap the shortbread cookies for gingersnap cookies in the crust? How would I make these mini, like in a muffin tin? I’d refer to this recipe as a guide. You could either half this recipe for 12-14 minis or use the full amount for 24-28. Cheesecake is best for 3-4 days and refrigerate until you are ready to serve. I have made a lot of cheesecakes, but had trouble with this. The cheesecake part pulled away from the pan while cooling and when I put the mousse on it oozed down into the sides of the pan and looks like a mess.It tastes great but the cheesecake is very dense. I think it was over cooked. Is there a certain temp that it should be cooked to? Should it still be a little jiggly in the center? I was going to take it to a dinner party but was embarrassed to present it as it was. Had to whip up a cake to take instead. My husband wants me to give it another try for Christmas. It’s possible that it was over baked. I don’t test the temperature of my cheesecakes, but you do want the edges of the cheesecake to be set and center still jiggly. It’ll firm up a good bit more during the cooling process, so it will over bake if it’s too firm before cooling. For the mousse topping, it sound like the whipped cream wilted. The powdered sugar is used to stabilize it, so if you happened to reduce that at all, it wouldn’t stay firm. Be sure to use the full amount and whip the cream until nice and stiff and it shouldn’t deflate. I hope that helps! Excellent! 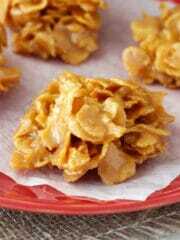 The filling is dense and creamy, but not heavy. It’s not cloyingly sweet. The spices are well balanced. I added a pinch of salt, grated lemon zest, and black pepper. For the crust, I subbed homemade gingersnap cookie crumbs for the shortbread and added some grated fresh ginger. The cheesecake baked for 1 hour 30 minutes. I left it in the oven with the door closed, then cooled it completely in the oven with the door open and the light off. The top was completely level and smooth. For the water bath I set the 9″ springform pan inside a 10″ cake pan, then set the cake pan in a large roasting pan. No need to wrap the springform pan in foil. I love a make-ahead dessert and this was perfect! Made it 2 days ahead and it was still excellent on day 3. I didn’t make the mousse, but covered the filling with dark and white chocolate curls instead. At serving time I added a dollop of cinnamon whipped cream and drizzled with a bourbon caramel sauce. Your additions and the bourbon caramel sauce sound yummy! I’m so glad you enjoyed the cheesecake! I am trying to make the mousse. I have combined the whipping cream, molasses, spices and powdered sugar according to the recipe. It will NOT thicken let alone form stiff peaks! What now? This is for the Gingerbread Cheesecake. There really isn’t any reason I can think of that it wouldn’t thicken. Heavy whipping cream is made to do just that. Are you able to make just whipped cream? Could I use double cream instead whip cream.shops got none? I haven’t ever used double cream, but as long as it’ll whip well, it should be fine. No, there’s no foil over the top. I hope you enjoy it!